On August 12, 2013 we three 2nd year Novices arrived from Peramiho in Ndanda to start our formative activities. I stayed for three days in Ndanda in the new Novitiate building, St. Hildegard. I was assigned to St. Agnes community in Nyangao. On August 16th I moved with a joyful heart to start my apostolate. I was received by the Sisters joyfully since they had been waiting for me. The following day I was given an orientation of the place. The assignment given to me was to help in the kitchen, together with the care of the children in the Parish and to attend to the poor, who come every second Friday in order to get material and spiritual help. There are 40 of them. On October 17th, I had the chance to visit leprosy patients in 4 villages: Chiuta, Mandwanga, Malungo, and Nambalu. At 10:00a.m., we started our journey. The group included: Dr. Nyagali from Nyangao Hospital who is experienced in the treatment of leprosy and tuberculosis patients, Sr. Tumaini, our Superior and Nurse in Nyangao Hospital, Sr. Columbia, Pharmacist at Nayangao Hospital, Our driver Lenard and myself as helper. We arrived at 11:30 and found the patients waiting for us. 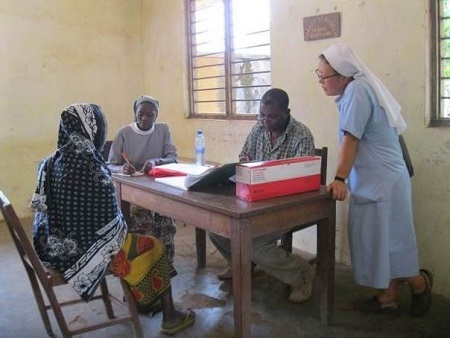 Immediately after our arrival we started the work: Dr. Nyagali prescribed medicine, Sr. Tumaini dispensed the drugs to the patients. In spite of available drugs there is still a good number of patients suffering from the disease, be it active leprosy or the late effects. They are handicapped in their work for daily sustenance because of crippled limps. Therefore they need medical treatment, but also material support. Sr. Columba and I distributed the gifts we had prepared. 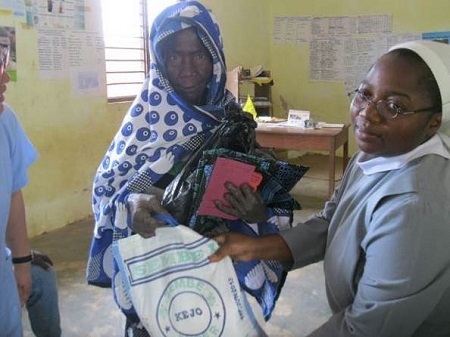 Each patient received 3kg of beans, 5kg of maize flour, one pair of shoes, and one pair of traditional clothing for the women and a T-shirt for the men. All this was possible through the donations from Korean benefactors. The patients were very grateful, and we were happy to see their improvement after getting treatment. After finishing this work in the 4 villages we returned to Nyangao. I am grateful to God for my missionary vocation which allows me to see the needs of the people around us. In providing our care we give them also hope. And there are so many who are thirsting for love and care. This experience made me realize my duty to bring hope to the world. I thank the community of St. Agnes Nyangao for giving me this opportunity.